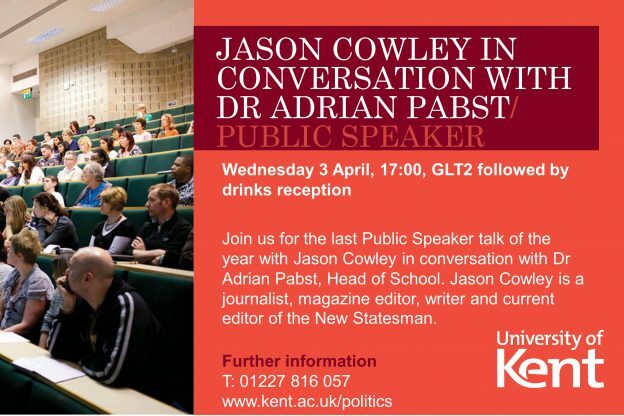 The editor of the political magazine, the New Statesman, Jason Cowley appears at the University’s Canterbury campus on Wednesday 3 April. Mr Cowley will take part in a conversation with Dr Adrian Pabst, Head of the School of Politics and International Relations (POLIR), as part of the POLIR Public Speaker Programme. The event will take place in the Grimond Lecture Theatre 2 at 17.00. Admission is free and open to all. There is free parking on campus from 17.00 and the talk will be followed by a drinks reception. Jason Cowley is a journalist, magazine editor and writer. He has worked for Granta, the Observer and the Times. As current editor of the New Statesman, he is credited with revitalising it, and re-establishing it as an influential weekly publication. He has written books about politics and football. His next book will explore England and Englishness, expanding on his essay on England Rising.